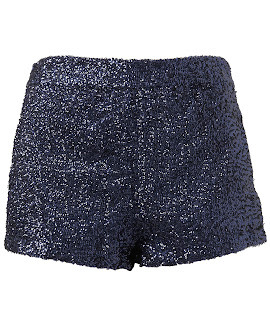 For some reason I've always found myself strangely drawn to the allure of a pair of sparkly hot pants. Practical? No. Useful? No. Timeless? Hmmm perhaps....? I've never taken the plunge and bought a pair because apart from a fabulous New Year's Eve party or some kind of embellished circus fancy dress theme, I can't really see myself having the guts to try and pull them off. So without an infinite shopping budget there just never seems to have been a moment that justifies them. Plus, they're midnight blue-who can resist midnight blue?